I ventured in to a dimly lit room on the first floor of the Manchester Art Gallery. After adjusting to the low lighting, having arrived from the rare Manchester sun, my eyes were drawn to the walls. Warm spotlights brought a collection of rectangular frames of paper drawings to my attention. I was at the press preview of the gallery’s latest exhibition – Leonardo da Vinci: A Life in Drawing – a homage to one of the world’s most treasured artists in the build-up to the 500th anniversary of his death. This exhibition is one of 12 that are taking place across the UK, and is made up of works from the Royal Collection. Each gallery has been loaned 12 of the Renaissance master’s drawings, in a celebration of the sheer diversity and innovation of his art. What makes this project particularly special is the sense of geographical inclusion; by running 12 shows concurrently, it is estimated that over half the population of the UK is no more than an hour’s drive away from witnessing these intricate masterpieces. Given the usually London-centric approach to displaying works of The Masters, these attempts to improve accessibility of this exhibit marks a refreshing moment of unity in a time of profound discord. Curator of the Manchester Art Gallery, Natasha Howes, describes how the mancunian embodiment of this project is slightly different to that of the 11 other exhibitions.Ten years ago, the gallery displayed an exhibition of da Vinci’s drawings from the Royal Collection, so this time round was looking to do something a bit different. Whilst the other shows are made up of drawings spanning a range of da Vinci’s themes, this exhibition is thematically curated; the 12 drawings are all based around the human body. Be it meticulous anatomical sketches, or portrayals of idealised beauty and ugliness, Leonardo da Vinci: A Life in Drawing is an exciting insight into the mind of a genius. The works on show provide a snapshot of his artistic career, with the earliest of the drawings dating to 1480, whilst the latest is thought to have been produced just before his death. Looking at this collection of drawings, one notes his artistic progression, as his style develops in his pursuit of anatomical perfection. Howes excitedly leads us to two of the drawings near the centre of the room, which are displayed in double-sided frames and portray da Vinci’s passion for anatomy. The drawings depict intensely scientific sketches of the foetus and female organs and are enveloped with scrawling notes in black ink. “What’s so brilliant [about the works] is they’re double sided, so we’ve ended up with 14 for the price of 12”, says Howes. What is striking about these works is how the entire surface of the paper has been covered with annotation and sketches. Da Vinci has written in a slanted mirror script, which despite seeming intensely cryptic, was rather to avoid smudging his work as he was left handed. Howes informs us that these drawings were never made to be displayed on a wall, but are in fact working sketches to establish a greater understanding of the human body. 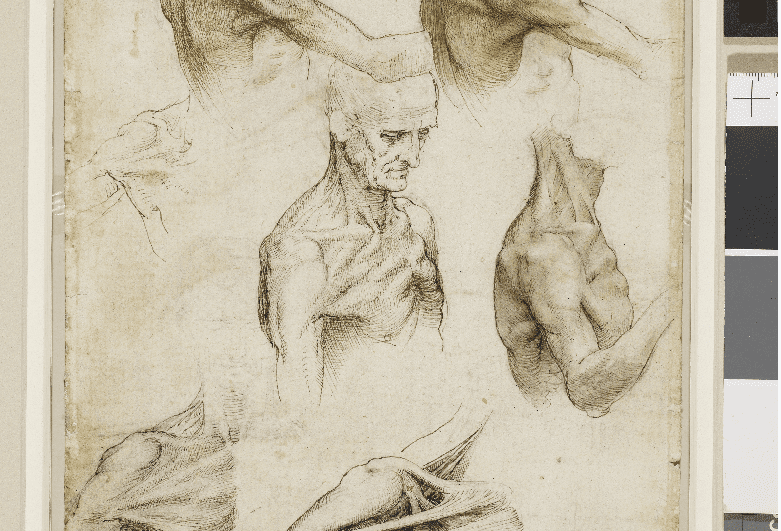 In fact, in comparison to an earlier drawing on show, which was completed before da Vinci undertook any scientific exploration of the human body, these later sketches reflect the impact of dissections da Vinci attended in the winter of 1510-11 at the University of Pavia had on his work. His sense of proportion and understanding of the inner workings of the human body is clear. However, this exhibition reaches beyond the purely anatomical. There are works which explore the movement of the human body, a drapery study for his famous ‘Last Supper’ fresco, and a curious image of an almost supernatural woman. When I asked Howes about this latter drawing, she beckoned us over to the piece. Howes recounts the mysterious nature of the drawing in question, describing how Martin Clayton (Head of Prints and Drawings at the Royal Collection Trust) deemed it “a real puzzle”. The theory is that this drawing is an imagined scene from Dante’s ‘Divine Comedy’, specifically of the character Matelda. Howes describes how the figure appears to have been “conjured out of the air, she’s not solid, she’s totally ethereal”. The curious sketch, which was one of his last pieces of work, serves as an example of the diversity of da Vinci’s craft; he was a scientist, an inventor, a dreamer. I then discover why the room is so dark, Howes tells us that these drawings are incredibly sensitive to light and can therefore only be displayed every few years to preserve them. However, their remarkable fragility is also evident in their journey into the hands of the Royal Collection. Despite there only being 20 da Vinci paintings still in existence, 5,000 of his sketches survive. After his death, da Vinci passed these sketches onto his favourite pupil who numbered and bound them all in one book – a decision which treads a thin line between intelligent pragmatism and an act of total irresponsibility. Whilst this decision inevitably is the reason these works are still in existence, they could have so easily been lost in a single fire. Howes described the long journey that the collection took before becoming a part of the Royal Collection, travelling from Italy, to Spain, and eventually to England. This journey, however, raises several questions over the true claim of the Royal Collection to these works. I presented this question to the curator, who replied that this was is an interesting problem. She explained to me that there currently exists a dispute taking place between The Louvre and the Italian Government over its refusal to lend works of da Vinci to an exhibition in France, citing national ownership of the Italian artist.